Dominique Derain started his career making wine barrels but decided, instead, to study winemaking in Beaune. 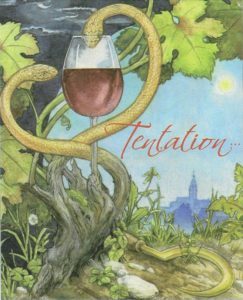 In 1988 he and his wife Catherine purchased 5.5 hectares of vineyards in Saint-Aubin just south of Beaune and began tending the vines biodynamically and making their wines in a non-interventionist way as well. This domaine has now been purchased by Julien Altaber and Carole Schwab of Domaine Sextant who will continue making the wines in the same style. Julien, of course, has been assisting Dominique in his cellars for over 10 years so knows each of the wines in detail. The wines are certified biodynamic by Ecocert and have been certified since 1989. 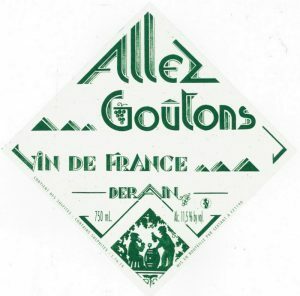 The Allez Goutons is a beautiful white wine made from Aligoté, one of our favourite white wine grapes. This wine is made by Dominique as an early drinking style to be consumed within a couple of years of being made. If you are a fan of this grape variety then you cetainly should give this wine a try. Despite the fact that it is a drink-now style it has incredible complexity and very good length. For this vintage we see Dominique handing over the reins to young rising star Julien Altaber, and Julien’s talent can be seen in the quality of the wine. The wine is still sold under the Derain banner, but if you look closely at the fine print you can see that Julien, who runs the Sextant domaine, now has begun to produce this cuvée. This is the first time there has been a red Derain Allez Goutons. It is a fresh lively red wine made from the Pinot Noir grape variety and designed for early drinking. We were delighted when it arrived in Australia fresh as a daisy and ready for immediate drinking. The Les Riaux is back with a stunning label and even a second name just to confuse everyone! It also now sports the name “Tentation” to reflect the label. This wine is an entry level Bourgogne red with the vines thriving on the Puligny-Montrachet plains quite close to the Aligoté vines. The grapes are harvested from the tiny Les Riaux vineyard which is close to the village of Saint-Aubin which lies just south of the central city of Beaune. The yields here are painfully low at only 30 hectolitres per hectare so expect this red to have good fruit flavours and good structure. It also has a bright and cheerful new label this year! Dominique destems most of the grapes with just a few whole bunches thrown in. After pressing, the juice and skins are transferred to large wooden vats for maceration for up to two weeks before the juice is transferred to old oak barrels for six months of maturation. And by the way, the vineyard is tiny at less than half a hectare! 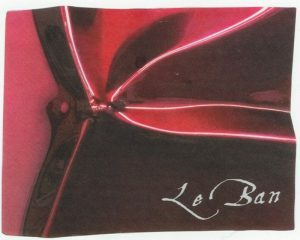 The Le Ban is one of the best wines from the Derain vineyards! The 2010 reflected the vintage which was not as hot as 2009 but which encouraged slow but steady growth in the vineyard leading to wines with good structure and length. The 2013 was a tough year but the wines that were produced from a smaller harvest were very good. Then again, 2015 was a great vintage! This wine shows just how good wines can be from the underrated appellation of Saint-Aubin. The vines here (which were planted in 1920) thrive on an east facing slope covered in limestone derived brown clay and gravel. This is a lovely wine with an appealing cherry and strawberry fruit flavour, a core of acidity, great freshness, an underlying spiciness and perfect balance. Great drinking now but it is a good idea to pour the wine into a carafe before drinking. This is an interesting cuvee because it has a small amount of Pinot Beurot (Malvoisie, Pinot Gris) blended with the dominant Pinot Noir. (Incidentally, Pinot Liébault is also permitted in this appellation). The Mercurey appellation is increasingly receiving critical acclaim as a number of young winemakers have recognised the attractive nature of the terroir here and are producing wines of considerable elegance. La Plante Chassey is a south-east slope with clay soil. The grapes for this wine are harvested by hand and the wine is fermented in wooden vats before being transferred to old wooden barrels for 18 months. The wine is not fined or filtered before bottling. There is lots of limestone here because it is quite close to one of our favourite villages in Burgundy, namely Pommard! This village is well known for the intense, structured red wines that benefit from the iron-rich, red soils that surround the village. This is why red wines are particularly favoured here – Pinot Noir has a particular affinity for these soils and therefore the Pommard reds are sought after. 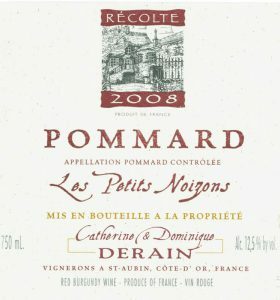 The Les Petits Noizons is one of the best sites in Pommard and therefore the wines are particularly attractive. The 2011 is a lively, strong, structured deep-red wine showing all the complexity and elegance you would expect from a Pommard! 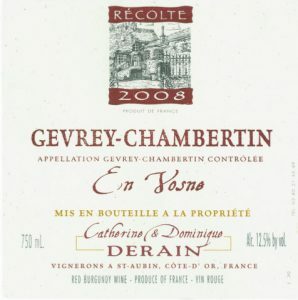 Gevrey-Chambertin is well known for the intense, structured red wines produced around this village which lies on the Cote d’Or just south of the city of Dijon. The vines in this En Vosne vineyard are nearly 90 years old! Therefore there is structure and depth of flavour coming from them. This is a superb wine of considerable complexity and great elegance. At a number of recent tastings this has been a stand out wine that has charmed all who have tried it. It is a beautiful Burgundy at a very reasonable price for a Gevrey Chambertin. Note that there are only small quantities of this vintage available due to the poor growing season. The price also reflects the dramatically plunging Australian dollar. Aligoté is a particular favourite of ours. We love wines made from this grape that is beloved by Burgundians – many of whom consume it daily. The wines range from the rustic to the ethereal. It is unfiltered so the wine can be cloudy in the glass. It is fermented with native yeasts so it is alive and vibrant and completely compelling. The very old vines for this wine are on the Puligny-Montrachet plains. A lovely wine for summer drinking. For this year there is a radical new label on the La Combe, with a number of almost impenetrable in-jokes about Derain and his wines. Don’t worry about the fact that this is a ‘simple’ Bourgogne wine. The vines from which this wine is made have an excellent pedigree. The vines for this lovely Chardonnay are located close to the village of Puligny-Montrachet where there is deep brown soil. The yield is only 35 hectolitres per hectare and this means the fruit is packed with flavour and the wine reflects this. La Combe is a tiny plot being less than one third of a hectare. This is a wine for contemplating. It opens up slowly in the glass, but then reveals an array of flavours and aromas that are truly compelling. This is a lovely, expressive Chardonnay. 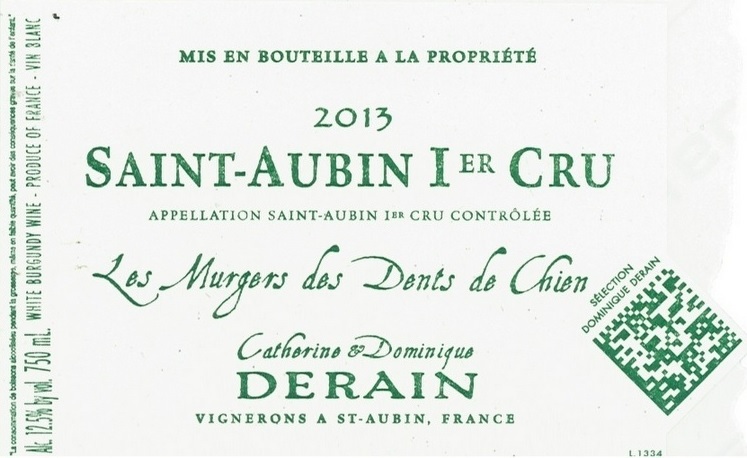 This is a new wine for Dominique Derain – adding to the list of Premier Cru Saint-Aubin wines that he makes. This one is a site-specific Premier Cru from the Les Murgers des Dents de Chien lieu dit which lies betwen 320 and 370 metres above sea level and overlooks the vineyards of Chevalier Montrachet and Le Montrachet and borders the Le Champ Gain lieu dit which is one of the Puligny-Montrachet Premier Cru sites. Les Murgers is widely regarded as the best site in Saint-Aubin for white wines. The soil here is very thin and the vines must struggle to gain a foothold among the limestone rocks. But this struggle produces what many claim are the best wines from Saint-Aubin. The name is made up from two aspects of this vineyard. Murgers are small walls built from the rocks that were removed from the site to plant the vines. And Dents de Chien translates as dog’s teeth which refers to the white (calcareous) triangular rocks found in the vineyard. This beautiful wine is 100% Chardonnay. This delicious premier cru Chardonnay is made from vines in the En Remilly lieu dit which lies on the rocky, sunny slopes of Chassagne-Montrachet. The En Remilly climat lies at the southern end of the village of Saint-Aubin and crosses the boundary into Chassagne-Montrachet where it is also a premier cru vineyard with the same exposure and the same rocky limestone soil. This makes these premier cru wines some of the best value in Burgundy. The yield is relatively low at 38 hectolitres per hectare. The wine is both powerful and elegant making it perfect for aging – however it is also drinking nicely now. This delicious Chardonnay is made from vines in the En Vesvau lieu dit which lies on the rocky, sunny slopes of Montrachet. The terroir here is perfect for the production of flavoursome white wines for which the area is rightly famous. The yield is relatively low at 38 hectolitres per hectare. The grapes are picked by hand and placed carefully in small boxes to avoid crushing the fruit. After crushing the juice is left to ferment using the complex natural yeasts that collect on the fruit. The wine is both powerful and elegant making it perfect for aging – however it is also drinking very nicely now.